A journey to discover answers for the most critical questions in your life. 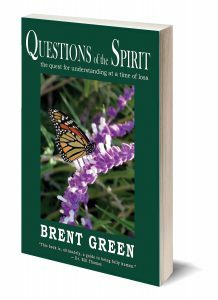 In Questions of the Spirit, author Brent Green guides readers through a thoughtful and inspirational journey of eighteen chapters. Each chapter explores a significant question about mortal existence, the nature of loss, and life’s most difficult challenges. Evocative chapter themes include: What was your first experience of loss? 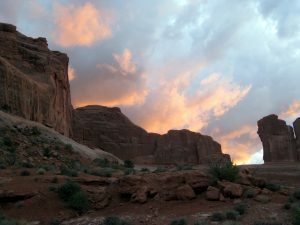 Is there value in suffering? Have you been blessed? After each chapter, additional questions inspire further contemplation and healing insights. This finely crafted book includes poems, essays, and inspirational stories about those who overcome illnesses, misfortunes, rejection, and death of loved ones. The author also explores loss of a friendship with someone still living, loss of status, loss of self-confidence, loss of purpose, and loss of opportunities. Loss comes in many forms throughout life. Loss is a requisite part of the human experience. Loss often means pain, but loss also means growth. This book can become a pathway to greater spiritual awareness, a more resilient outlook, renewed faith, and hope in times of tragedy. It adds value with each new loss. 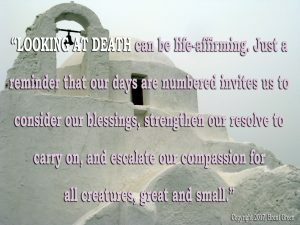 And the book can stimulate deeper dialogue among those who gather to discuss mortality and the hereafter. Brent explains how he learned to appreciate and honor the value of suffering, which he explores in the first chapter of Questions of the Spirit.